This week the challenge is to use the tangle pattern Mi2 created by CTZ Mimi Lempart. I really love this tangle pattern. It looks so complicated yet is very easy. The spacing is the hardest part for me. I confess, I draw a grid to help me get started. Without that my "seeds" would be all over the place but once I have them drawn, I am no longer following a grid. I used Mi2 in an Illuminated Letter that I made for friends so I have a little but of experience with this pattern. I haven't used it very often since then, so it was nice to have another go at it. I wasn't sure where I was going when I got this tile started. I drew Mi2 in the center and then decided what to do next. I wanted the pattern to stand proud in the tile, so I didn't draw a string. After I finished that, I decided to surround it with Verve, my latest pattern. I have been playing with it and wanted to explore it some more. I really like this one and it was a lot of fun to make. I have to say, this is probably the fastest tile I've done in a while. Thanks Laura for a great challenge. I am glad to hear that you had a good time in Philly. Have a great week everyone! I can't wait to see what you've created! Oh this belong in a fairy tale... a portal to a new and glorious land! Very nice! Love your Verve frame. it looks great with verve! i love it! Really like how you drew the Mi2 and surrounded it with Verve. Really pretty piece! Your verve complements and showcases Mi2 beautifully. I'm going to have to give verve a try soon. 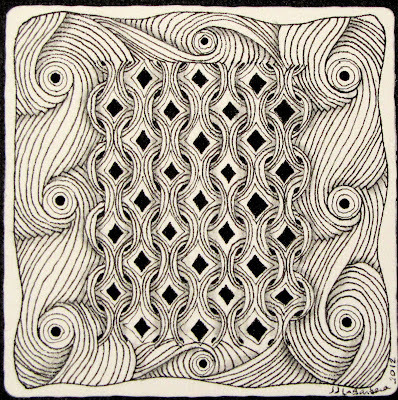 You made a great zentangle! I also used your tangle 'Verve' because is looks great next to Mi2. I tried Verve this weekend for the first time and I'm going to use it a lot I think. Love it! So, thank you. Very pretty - I'm a big fan of Verve too! Lovely, lovely! I like the vortexian (yeah, I just made that up!) nature of Verve with the calm order of Mi2. Wonderful contrast. Tangle on! Beautifully done! I also used verve, which I love. Beautiful, and Verve is just brilliant! 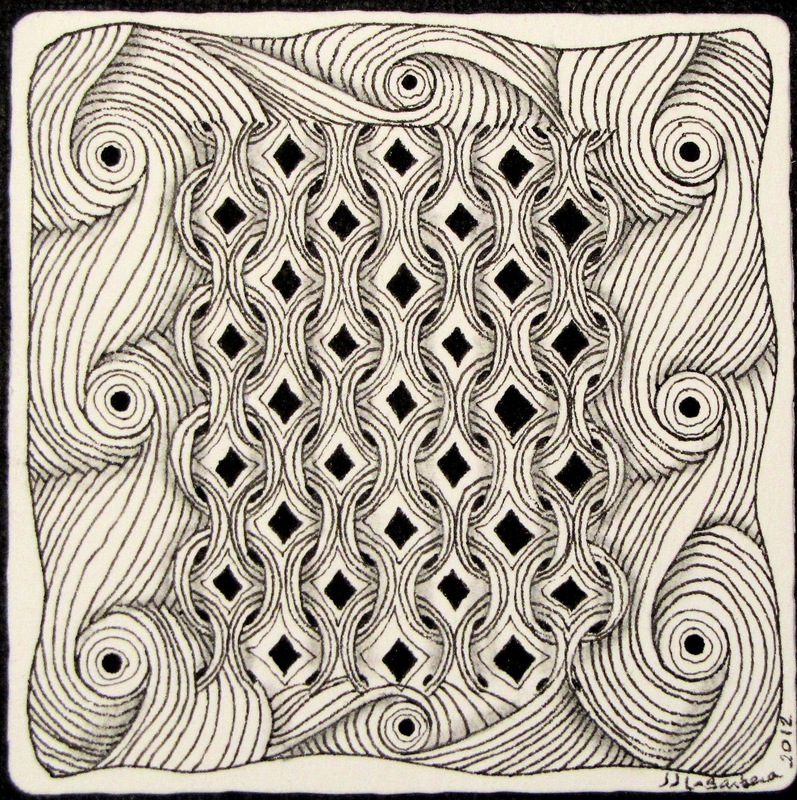 YOu have really created a marvelous zentangle!! So detailed!! Really nice complimentary patterns. Do you have a step-out for Verve? Is it to echo making interlocking "9" shapes? Ooo-looks really great with the verve--which is also really fun to do! Nicely done! Wonderful tile. Both patterns are so well done. I like how you used Verve. It's a nice contrast to Mi2. It really shows off Mi2, nice job. I like verve around it - kinda gives it this cool cushion. It looks very great with verve. Beautiful tile. Oh, nice combo of Verve and Mi2. I just did one I really like with Verve but it will have to wait for posting until later, maybe next week! Thanks for that one, it is a lot of fun.